As I said in the earlier post on Rome- it is an eternal city! There is so much to see and know. The guide provided by the package tour was quite good enough to open as many windows to the city of Rome in that short time, I mean a day and a half, that includes Vatican City too. Well, I do not have some glamourous night shots of this fancy city! I visited during the bright day light though I have seen the city in the night with some monuments decorated with lights, well from a moving bus! When moving on the roads and streets in between the ancient building you get a feeling of being in an ancient place where moderners live! The cars, gelato shops, outlets of world popular great brands and jeans clad tourists! Here is a medieval fountain surrounded by modern day cars! The river Tiber flows right in the heart of the city! Third longest and an important river in Italy. 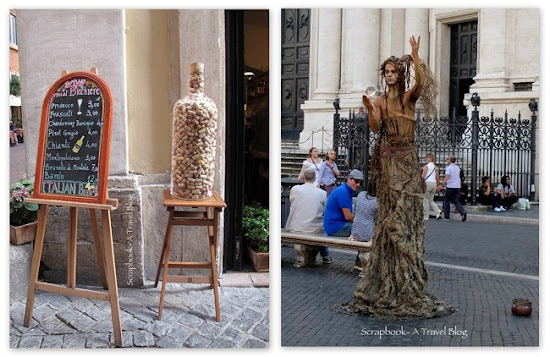 Rome is one of the touristy cities and so there are many street performers! This one was one of the best! Dressed like a tree he was very graciously performing with the crystal ball! See the restaurant entrance? A huge bottle filled with wine corks! Hand painted water color scenes from Italy. And the ancient looking touristy trams for the tourists! Hope you enjoyed my version of Rome. How was your experience in the city? it's tough to cover rome in a short time. one needs to stay there for at least a week to really scratch the surface, methinks. I do love Rome and these are great shots! So much to see there!! Have a lovely weekend! Beautiful photos of a great city. Very beautiful photos for SWF!Enjoy your photo tour in ItalyThank you for sharing and have a nice weekend. Rome is always a busy city. The Tiber looks even worse than when last I saw it. We thought about the same country this week: Italy! I've posted pics from a small city - Lucca (1 hour W. of Florence (Firenze). Thanks for the lovely photo tour. I have no words to describe Rome. It is amongst the bucket list of every traveller. You have written a beautiful blog and I enjoyed reading it. The pictures are also quite interesting and suits your post perfectly. Kusum, I think you have created a really amazing post.